It's been a long time since I have posted anything. Much has happened, and things are changing every day around here. Several times I have sat down to write, and I can't make myself type the things I need to say. I can't seem to wrap my brain around all the thoughts swimming around in my head. My little blue-eyed girl turned one about three weeks ago. I can't believe how much she has grown. I can't believe I am the mother of a one year old. She is on the verge of walking, and she is picking up the signs we are teaching her very quickly. "More" is the favorite, and she is also doing and understanding "down," "food," and "please." I am working on "thank you," but that one seems to baffle her still. 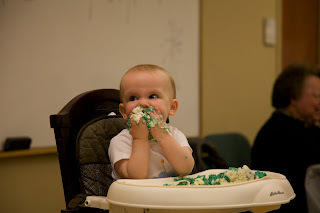 We had a beautiful "Winter One-derland" first birthday party. It was filled with warm winter soups and breads, blue snowflake cupcakes, and blue and silver ribbons, cascades of snowflakes, and glittery snow everywhere! Dear friends and family joined us to celebrate, and everything was absolutely perfect! That little Layla never ceases to amaze me with her kisses, love pats, curiousity, and sweet spirit. She pulls up on everything, laughs like a crazy woman when her daddy plays with her, and figured out just today how to open the wrapper of a Lindt truffle. By the time I got to her, the entire truffle was in her mouth and her little cheeks were puffed up like a chipmunk storing up for the winter. I wanted to laugh and cry all at the same time when I saw her. My family, my Chris and Layla, are my rocks, my stability, my inspiration. Over the past weeks I have been wondering, "what next?" And I still don't know. I have been fortunate to have a whole year at home working hard to teach my little girl everything I can and love her as much as I can every single day. I have been able to make my home comfortable and welcoming. I have learned how to be a healthy cook and supporting wife. I have learned what it really means to be a mother, and what it really means to love unconditionally. I have spent a lot of time taking care of everyone, and I would not trade any minute of that for the world. But, I am learning now that I have to take care of myself too. If I can do that, then I am better for all the other people I take care of. The one thing I have done for myself all along is exercise, eat right, and work hard to get back to my pre-pregnancy weight. I have hit that weight, and am working to lose about 5 more pounds. It is so wonderful to fit into the designer jeans Chris bought for me 5 years ago on Valentine's day! That makes me so happy, but there is more to life than fitting into designer jeans. I have always known this, but I am really starting to understand now just how much more. I am in this constant battle in my mind these days. I am struggling with where to go next. Thus far, I have pretty much just floated through life, settling where I land. My first job after college was the first and only job I interviewed for. The job I took next was one that just fell into my lap. I was not even looking. A friend told me about this job, I sent in my resume, interviewed, and accepted the job all within a 5 day period of time. In the past 8 years, these are the only 2 jobs I have had. Four days after Layla's birth, my company closed its doors. I have not been back to work since. Now, the time has come to find a new career. I can't imagine taking Layla somewhere and having someone else care for her. I know where we choose to send her will be just fine, and that she will be very happy. But, I dread the day I have to drop her off, walk away, and go to work. I know that my family needs me now to help pay the bills. I have to find my place again in the real world, and not just in my little world of Willow Pond. I just don't know where that place will be. Soon enough I will figure it out, and soon enough our lives will change, yet again! You make me cry! Wow, what a year it has been!!! I know you will find something that "fits" you, just know that daycare/childcare is not a bad place! Take that from someone who struggle everyday with that fact that I'm a full time (most days more then full time) working momma. I would not trade Ava's teachers for the world and I honsestly believe they are the reason my little preemie is not behind, but it is hard to say good-bye every morning, and that does not get easier. However, it's the best thing in the world to see her face light up when she notices I have come to pick her up! Don't worry friend, you, Layla, and Chris will be ok no matter what path you take.